The retinal vein occlusion is an eye condition which can lead to reduced eyesight or even blindness. It requires a thrombolytic drug injection into a vein, which has a thickness of a single human hair. This drug can dissolve a blood clot in the retinal vein. But the procedure is extremely difficult because it requires high precision, which can be very difficult to achieve with human hands. 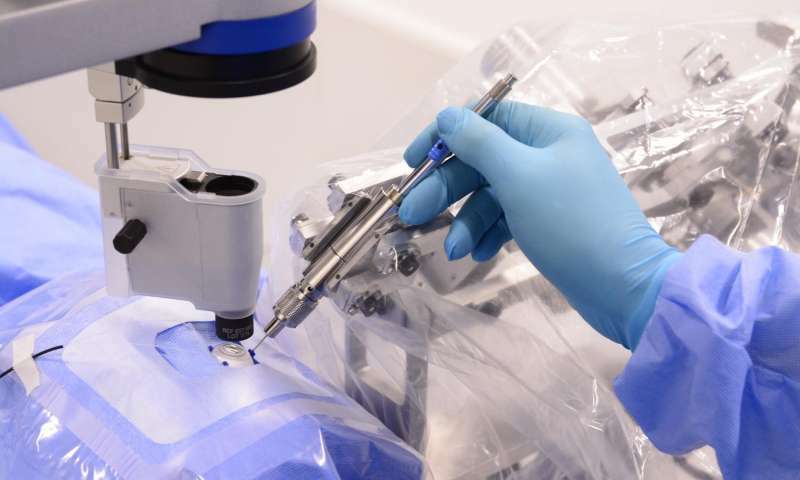 Thanks to researchers from the KU Leuven University in Belgium, this procedure can now easily be executed by a surgical robot. It takes about 10 minutes for this drug to be administered into the vein. But the vein is just 0.1 mm wide and is thus problematic. So the researchers developed a robot which can insert the needle into the vein at the perfect precision and also hold it perfectly still till the drug is injected. The robot inserts a needle which is 0.03 mm wide, 3 times thinner than the human hair. After a clinical trial, the results came out successful, according to the university. The clot was dissolved successfully and the patient seems to be doing well. The surgery was just a first part of the trial, according to the researchers. Before they start providing the same treatment to all the other patients suffering from retinal occlusion, they need to monitor the drug’s effects. The drug injected by this surgical robot should have the same effect on all patients, but further clinical trials are needed to make sure. “The current treatment for retinal vein occlusion costs €32.000 per eye. This is a high price tag, considering that you’re only treating the side effects and that there is little more you can do than avoid reducing eyesight. The robotic device finally enables us to treat the cause of the thrombosis in the retina. I look forward to what is next: if we succeed, we will literally be able to make blind people see again”, said Professor Peter Stalmans, an eye surgeon at the University Hospitals Leuven. That is a huge statement – to make blind people see again. But it is very much possible after this surgical robot is tested with more trials and is proven to be consistently successful.